Children with special needs often require support to stand with a well aligned posture. Upright standing with weight bearing through the legs at an age appropriate time in a child’s development is essential, regardless of whether the child can achieve this milestone on their own. Clinical research has shown that normal development of bones and muscles in growing children requires weight bearing. In fact, standing facilitates the formation of the hip joint in early development. Respiration, circulation, digestion and ultimately a person’s overall sense of wellbeing is profoundly impacted by being given the opportunity to stand. Our staff clinicians are always delighted by the “I can do anything!” attitude that consistently develops when we help someone get up onto their feet. 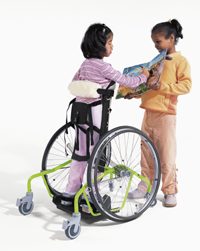 Providing the necessary adaptive equipment required for a daily standing program is easy at Adaptivemall.com. The selection of an appropriate stander should be approached creatively to meet the unique needs of your child. This decision is best supported by a wide variety of options. 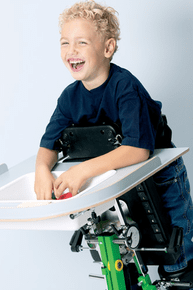 If your child requires a prone stander (support in front), a supine stander (support from behind) or would benefit most from variations in the manner that support is offered, you will find them all at Adaptivemall.com. 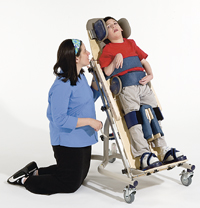 You will also find standers that limit their support to the legs only, assist with sit to stand transfers and allow a child to be mobile while in the standing frame. With an ever-increasing array of special needs standing equipment, you can be confident that Adaptivemall.com will make available to you the tried and true classics and the cutting-edge advancements in standers spurred on by rapidly changing technology. But if you aren't sure which product is right for you, we always recommend reaching out to us Adaptivemall.com is staffed by physical and occupational therapists and intervention specialists who are happy to provide you with custom advice. All seating selections have been handpicked and recommended by therapists and families with special needs children. 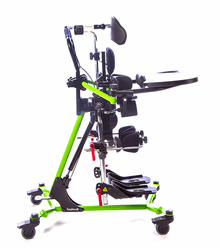 This equipment is appropriate for but not limited to children with diagnosis of Cerebral Palsy, Spina Bifida, Muscular Dystrophy and Traumatic Brain Injury.